In a small mixing bowl, whisk together 1 1/2 cups granulated sugar with 3 Tbsp flour until well blended. Add softened cream cheese to a separate mixing bowl and pour sugar mixture over top. Blend mixture on low speed until smooth. Mix in eggs one at a time and blend on low speed, while scrapping sides and bottom of bowl and mixing just until combined after each addition. Add vanilla, sour cream and heavy cream and mix just until combined. Tap mixing bowl against counter top about 30 times to release some of the air bubbles. Divide mixture among muffin cups filling each cup nearly full. Bake in preheated oven 20 - 23 minutes, centers should still jiggle slightly, don't overbake (if they begin to crack they are starting to become overbaked). Remove from oven and allow to cool 1 hour. Cover loosely with plastic wrap and transfer to refrigerator and chill 2 hours. 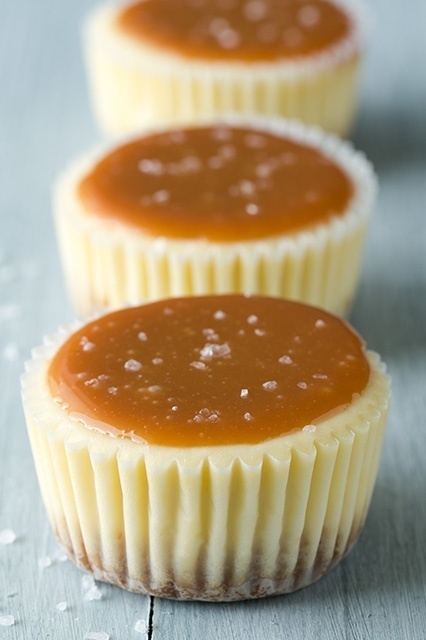 Serve chilled with a spoonful of Salted Caramel Sauce or Strawberry Sauce (note: for best results spoon topping on just before serving). Store in an airtight container in refrigerator or freeze.